In November 2014 a 30-year-old woman gave birth to full term baby at Blacktown Hospital in Sydney. Her newborn baby boy was healthy and robust but the mother was alone for her birth, unsupported by the baby’s father or family. The woman was sentenced to o a maximum of three years and six months in jail but will be up for for parole next month. Via Seven News. Thirty-six hours after the newborn was born the young mother, from a Samoan family in Sydney, travelled by train to Quakers Hill. There she sat in a park for a short while and then walked to the nearby M7 – a major road in the area, wrapped her son&apos;s feet in a plastic bag from the hospital "because she was putting his feet down first" she told police, and pushed her newborn baby through a small hole in a concrete drain. The baby, still wrapped in his striped hospital blanket and still with a peg to his umbilical cord fell 2.5 metres down the drain. There he lay for five days abandoned at the bottom of the concrete dungeon. His mother had hid her pregnancy from her Aunt and Uncle with who she lived in Quaker’s Hill. For five days she was the only person who knew that lying underground on the side of a major Sydney road was a newborn baby boy. For five days she thought her plan had worked. He was dead and she was free from her responsibilities as his mother. Yesterday the woman, who was tracked down by police through hospital records and arrested, learnt that her desired freedom would arrive – later than she hoped – but still just one year and nine months after she was arrested. The baby was finally found by cyclists five days after he was abandoned, it took six men including three police officers to lift the concrete slab covering the drain, which weighed over 200kg. Underneath, they found the newborn baby wrapped in a hospital blanket, with a peg still attached to his umbilical cord. It took six men including three police officers to lift the concrete slab covering the drain. Via Twitter. One of the cyclists who found the baby 2.5 metres down the drain told Fairfax Media at the time “I’ve got two kids of my own, so I know what a screaming baby sounds like”, said Mr Otter. “It was so intense, you couldn’t not tell it was a baby”. “When I arrived there were several bike riders, cyclists and pedestrians standing around the drain. Myself and several other police have come up, we heard something coming from the drain,” Senior Constable McAlister said told The Daily Telegraph. “How could someone do it? I, myself, have kids and we’re expecting a baby in a few more months so it’s not good that someone’s going through this and has done this to a little one,” he said. Police pulled the newborn from the drain. Via Seven News. The woman pleaded guilty to two charges and was sentenced to a maximum of three years and six months in jail but with a minimum of one year and nine months she may be released within weeks on parole, after time already served. She had her attempted murder charge downgraded to abandoning a child under seven causing it to be in danger of death and recklessly causing grievous bodily harm. The court heard the mother had been abandoned by the father of the baby, with whom she had a brief sexual relationship and that she denied she was pregnant to her family, factory co-workers and new partner despite her growing baby bump. The woman told police that after leaving hospital she went to the M7. “Then I just saw the drain. Then I just put baby in there,” she said, saying she heard nothing after the boy had fallen to the bottom because he was “sleeping”. 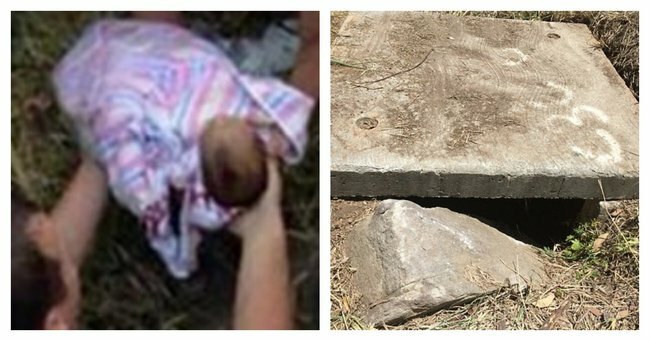 The mother admitted that for several days after she abandoned her newborn she returned to the stormwater drain to check whether he was dead and hearing no noises assumed her baby had died. The woman returned to the scene several times. Via Twitter. Judge Andrew Colefax found the woman, had the intellectual capacity of a mid-primary-school-age child and was significantly intellectually and emotionally impaired to be "totally overwhelmed by the situation in which she found herself". The woman had tried to seek a termination less than a month before she gave birth but was told her pregnancy had progressed too far. The judge said that without holding anyone to blame “some warning bells should have gone off” when she gave birth at the Blacktown Hospital,"
One hospital worker noted that "there is something not quite right" with the mother and baby. But another observation said the woman was also observed to be interacting with the baby in a normal way including holding, breastfeeding and bathing him. Judge Colefax said that the woman, who wept throughout the proceedings, had no previous criminal history, now had the support of her family, and her intellectual deficit reduced her moral culpability. Fairfax Media reports that in court she was supported by her current partner and her family. "I think the perfect storm of factors which led to this shocking crime were both largely out of the control of the offender and are extremely unlikely to be repeated," Judge Colefax said. The baby, who is now 20-months old lives with a foster family and had no obvious long-term consequences of his mother’s actions. A foster carer for the baby told the court he had met all "milestones" expected of his age.